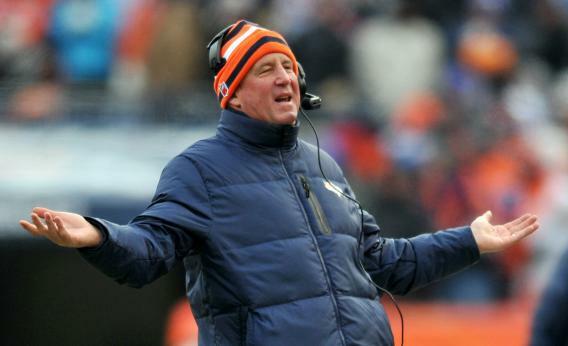 John Fox, Broncos-Ravens: Did the coach’s risk-averse approach cost Denver a playoff victory? Did the Denver coach’s risk-averse approach cost the Broncos a playoff victory? Denver Broncos head coach John Fox during the AFC Divisional Playoff Game on Jan. 12, 2013 in Denver, Colo. Photograph by Dustin Bradford/Getty Images. NFL coaches will often refer to “playing the percentages.” But if there’s one thing I’ve learned by studying strategic decisions, it’s that coaches don’t have a firm grasp of those percentages. And when anyone is uncertain of the odds, he’ll fall back on the sure thing. That was the case with Broncos coach John Fox, who opted for the conservative approach at almost every opportunity in Saturday’s playoff game against the Ravens. Even so, Fox is getting more criticism than he deserves. The Denver coach isn’t the reason the Broncos lost. Fox’s first conservative decision came after a Baltimore touchdown tied the game at 21 near the end of the first half. Denver had a first-and-10 at its own 20 with 36 seconds left on the clock and all three timeouts—five more seconds and one more timeout than the Falcons had when they drove for the winning field goal on Sunday. Even so, the Broncos elected to call a throwaway run play and head for the locker room. In recent league history (since 2000), teams in that situation score slightly more than 10 percent of the time, the vast majority being field goals. Turnovers are definitely a risk, and they occur about 8 percent of the time on half-ending drives. But the bulk of those turnovers are on Hail Mary-type passes, which virtually never result in an opponent being able to score. Taken all together, the numbers say the scoring expectation was positive for Denver by a factor of 3-to-1. That’s analytics-speak for, yeah, they should have tried to score there. Fox’s next risk-averse decision came late in the fourth quarter. With the Broncos up 35-28, the Denver coach chose to run the ball five straight times. Fox’s strategy succeeded in gaining one first down and forcing the Ravens to burn their last two timeouts. That left Denver with a third-and-7 at its own 47. Convert there and the game is over. Fox, though, decided to run rather than let Peyton Manning put the ball in the air. Ronnie Hillman was held to no gain, and the Broncos punted with 1:15 left on the clock. Calling this running play was the safe, “sure thing” for the Broncos. Fox virtually ensured that he’d burn an additional 40 seconds of time and pin Baltimore deep in its own territory with about 70 seconds to play. There was also a slim chance that Denver could have converted with the run, winning the game outright. A pass would have been a gamble. A successful conversion would sew up the win, but an incomplete pass would have given Baltimore the ball with about 1:49 left. Passing also brings an extra risk of a turnover, either via an interception or a sack and a fumble. For teams that need a touchdown to survive, time makes a big difference. With 1:09 to play, a team typically has a 13 percent chance of scoring a touchdown. With 1:49 to go, they have around a 26 percent chance. The choice, then, is between conceding Baltimore the 13 percent shot or gambling that you’ll either win the game outright or give Baltimore a 26 percent chance to win. League-wide, third-and-7 situations are converted 42 percent of the time. That means if Denver drops back to pass, Baltimore’s chance of winning is (1 - 0.42) * 0.26 = 0.15 = 15 percent. According to the math, then, Fox made the right call: Punting was, just barely, the right probabilistic call. Conservative call no. 3 came at the end of regulation, after Jacoby Jones got past Denver safety Rahim Moore to tie the game with his 70-yard touchdown catch. With 31 seconds to play and 2 timeouts, Fox repeated his decision from the end of the first half, electing to take a knee at his own 20 rather than let Peyton Manning try to maneuver into position for a game-winning field goal. It’s undeniably risky, but the odds are strongly in the offense’s favor there. Yes, the chances of scoring to win in regulation are small, but they significantly exceed the probability of a meaningful turnover. But in Fox’s defense, the Broncos and Ravens weren’t playing in the Georgia Dome. The wind was in Denver’s face on the final drive of each half—kickoffs in that direction were regularly getting returned, while kickoffs the opposite way were sailing out of the end zone. Field-goal kickers also get less accurate in cold weather, meaning the Broncos would’ve had to advance a long way down the field given the single-digit temperatures. There was also the matter of Peyton Manning’s arm. For whatever reason—possibly the cold weather having some effect on his grip—Manning did not appear to have the velocity needed for deep passes. Only 2 of his 43 attempts went more than 15 yards downfield. (Quarterbacks typically throw about 20 percent of their passes deep downfield, and Manning averaged 19 percent in the regular season.) So even if the probabilities suggest that Denver should’ve tried to score, you can understand why, given all these factors, Fox sat on the ball. The coach’s final conservative decision was a bit more under the radar. In overtime, the Broncos faced a fourth-and-1 from their own 39, and Fox should have gone for the first down. Intuitively it might seem suicidal to go for it in your own territory in overtime, but the rules of sudden death make possession far more valuable than field position. Punting was the sure-thing option, virtually guaranteeing the Ravens get the ball near their own 20. Going for it is obviously an enormous gamble, but believe it or not, the odds favor it. Manning’s short game was working well. He completed 68 percent of his passes on the year and 65 percent on Saturday. Fourth-and-1 situations are converted about 72 percent of the time, and given Manning’s accuracy a quick pass would have been a high probability bet. The math works out so that, based on general averages, the punt would have given Denver a 49 percent chance of winning, but going for it would have worked out to a 53 percent chance. But again, Fox didn’t necessarily do his team a disservice here. The Broncos were heavy favorites, having beaten the Ravens 34-17 in Baltimore just a few weeks earlier. The right overall approach for Denver was a “low-variance” strategy, relying on the team’s overall superiority to methodically come out on top. The better team should avoid high-leverage situations that put the game at the mercy of a few big plays. Unfortunately for John Fox, Baltimore succeeded by pursuing a high-variance strategy. They went for the big play time after time, getting touchdown passes of 59, 32, and 70 yards. That’s exactly what a big underdog needs to do to win. Fox’s conservatism may have cost his team slightly, but he didn’t decide the outcome of the game. The effect of these four calls was swamped by the impact of a few big plays, any one of which would have given Denver the win had it turned out differently.